the cute life: In progress.. So!! My dad and stepmom got me an early birthday present!! I'm excited to use it more and learn how to work all the bells and whistles. I have all of the supplies I need for pouches laid out on my ironing board so I can make some makeup bags/larger pouches today. 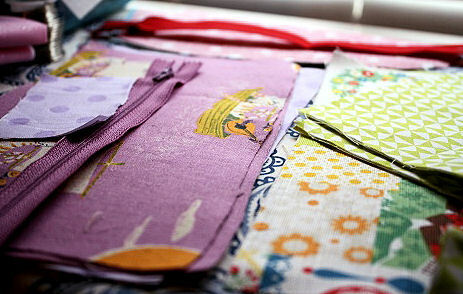 I love the weight of the linen blend (it's heavier than 100% cotton) and all of the adorable designs. I'm all out of pink zippers so I am unable to use the rest of my new fabric, but never fear! I have an order of zippers coming in next week. My earrings have gotten a pretty good reception, too! 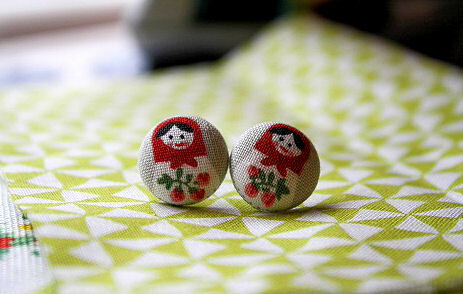 I think these Russian nesting doll earrings are my favorite so far. I also made them in a slightly larger 7/8" size so that two dolls fit on one earring.